Our compact size flagship Lumonite Compass R is a headlamp, designed in Finland for demanding professional use, and it is rechargeable. The lamp can be easily charged without removing the battery by using the Lumonite SnapCharger™ USB.charger. When designing Compass R, our team was striving for simplicity, performance and absolute operating reliability. Its one-part case is fully water, dust and shockproof and contains no moving parts. Its electronics offer optimal operating efficiency, a functional cooling system and its design combines a great level of light power with a long operation-time. 1054 Real Laboratory Tested Lumens! Over 52 000 pcs sold in Nordics! One of the points our design team started with was creating an effective lamp that could be applied in demanding environments, where safety gaskets are used. 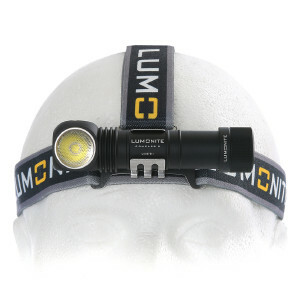 The lamp utilizes the Lumonite Releasy™ system; thanks to which the light can be removed from the headband in a single motion. This way, the lamp can be used as a hand lamp and can also be attached to a helmet, using a Lumonite Releasy™ helmet fastening. Lumonite Compass R’s beam of light is a multipurpose combination of light beam, thanks to which the lamp is well suited to extensively varied, as well as demanding applications. 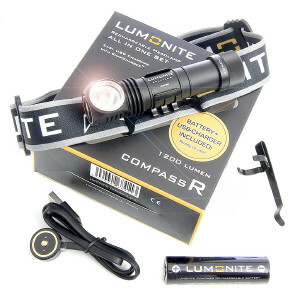 The flagship of the Lumonite Compass series operates by means of lithium battery, that is easily replaceable. "The peak is easy and fast battery charger connects in less than a second and can be downloaded via a USB cable via USB connection in a boat, car, aircraft and elsewhere on a computer or external power bank.I can also download the standard in the power grid, It is enough for the most demanding user and ergonomics on the straps will work from calf to cowhide, and the bonus is that the light will get out of the way for a second in a second, and no longer need more lights. "Headlamp came to the need and ended up with the recommendation of two hunting friends for that model. The lamp is easy to use and extra unnecessary functions (strobes / timers, etc.) are cut off. The button on / off is big enough for the lamp to get the gloves on. However, the experience is still not thick in winter. The main rim is high quality and easy to tighten. The weight of the lamp is appropriate and does not hinder head movements. An important feature, for example, at high speed in a wreck on a moving boat, when all the heavy shifts are duplicated if the end is over weight. Light intensity levels in different modes are appropriate, though Moonlight mode could be found even slimmer. (Chart number, etc.) The charger may be best for the entire device. The most convenient charger that has ever been responsible for. I also appreciate the waterproofness of the device! The light beam is just right for the headlight.